A cold walk on a misty day. Avoiding glassy puddles. Watching the steam from your breath create fog. Now that I've been getting back into my practice, even these gray days walking (sometimes running when I'm late) to yoga seem to be imbued with meaning. I don't know if this is the case with all mindfulness practices, but I find that the time just before and just after doing my asana practice just happen to be more crisp and aware than the rest of my day. Maybe it's my brain flooding with happiness chemicals in anticipation of all of the good feels that yoga creates in my body/mind. I don't know. Some people call it the "artists mind." It's the same feeling that I get when I go deep into creating art -- usually music or creative writing. It's this clear awareness that makes it possible for inspiration to fill me, the empty jug, with pure expression. I've never written anything successfully without that artists mind. And since I've been coming to the mat, practicing every day, I feel like I can access it more frequently. If you've ever had writers block, you know the pain of not being able to get into that creative flow. You show up to do your work and nothing comes out. Or you do the writing and it's all sh*t for months. And it feels like some distant memory, the last time you got into that flow. The last couple of years I've barely been in it, but I now realize that part of that is due to having dropped out of my mindfulness practices. And now that I'm back into it, I feel like slapping myself on the forehead. Of course there's a correlation. Of course. The magic and mastery is in consistency. Show up every day. Do your work. Find that clear awareness. Then let the words come from that place. Then when I find myself in a particularly inspiring moment I can get into that blissful, deep awareness that leads to more & better creative work -- whether I'm going for a jog with a friend up a new-to-me hiking tail, watching the light from the sunset turn one side of the empty forest gold while the other side fades to dark blue; Or I'm rolling cookie dough into rounds in the palms of my hands -- dipping each by each in sesame seeds. These cookies came out of many hours of searching for a good, original take on blood orange. I fluctuated from wanting blood orange angel food cakes, to muffins, to a citrus salad, to biscuits with jam, to scones and waffles. But sometimes it's good to stick with classics. These tahini cookies, based loosely on Molly Yeh's walnut butter cookie bars, have worked well for me with a number of different nut butters. Almond butter is probably my favorite iteration for a day-to-day cookie to have around (made with coconut sugar). But these tahini babes are probably my favorite thing that I've made with tahini to date (I've been on a bit of a tahini kick recently). Plus this blood orange curd recipe that I messed around with last year has become a Winter classic in my house. These sandwich cookies would be so good with a lemon or grapefruit curd as well. In a double boiler combine your eggs (whisked together well), sugar, ghee, and blood orange juice. Cook over medium heat, whisking relatively constantly and scraping down the sides. Cook until the curd has thickened and thickly coats the back of a spoon. Remove from the heat immediately and pour into a heat safe jar. Allow to cool to room temperature, then refrigerate to thicken the curd further. Can be stored, sealed, for up to a week. Preheat the oven to 325F. Line two cookie sheets with parchment paper, or grease with ghee or coconut oil. In a large mixing bowl, combine the tahini, cane sugar, coconut sugar, cardamom, and egg. In a separate small bowl, mix together the oat flour and baking powder. Add the flour to the tahini and sugar mixture and stir to combine. Chill the dough for at least 30 minutes to overnight in the fridge. Place sesame seeds in a small bowl and set aside. Remove from the fridge, and roll the dough into golf-ball sized rounds. Roll the balls in sesame seeds, pressing the seeds in with your palms, then flatten the balls until they're about 3/4 inch thick (they spread a bit in the oven). Place each cookie at least 1 inch apart on your greased baking sheet. Bake for 14 minutes -- the cookies will be a golden color, beginning to brown at the edges. Let cool at least 10 minutes before handling. To assemble the sandwich cookies, dollop about a teaspoon of blood orange curd on the bottom of the base cookie, then gently sandwich with the top cookie. 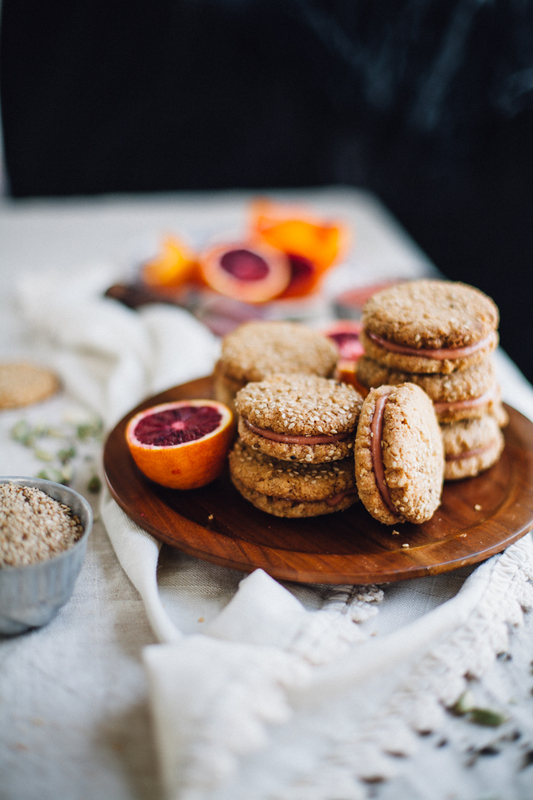 Continue until all of the cookies are sandwiched with blood orange curd. Eat immediately, or -- to firm up the curd -- place in the freezer for at least 30 minutes before eating your cookies. Can be stored in the freezer for up to two weeks in a tightly sealed container. So I guess sesame is my new obsession. Welcome! I’m Renee Byrd — Photographer, Blogger, sensitive soul, herbalism nerd and lover of lattes. I’m so glad you’re here.